The first stop in getting a question answered about Clatsop financial aid is the “Welcome Center” located in Columbia Hall. Staff can help with most questions about your financial aid. Forms needed to complete the financial aid process can be printed at the Welcome Center. The FAFSA can be completed on the computers in the Welcome Center. You can check your financial aid status on your MyCCC account anytime. Just log in and click on “Financial Aid Status”. If you have applied for financial aid but have not received your Award Letter, click on “What is Needed to Complete Application Processing?” on the Financial Aid Status page of your MyCCC account as soon as possible. The 2018-19 and 2019-20 FAFSA's are available. The first step to apply for student financial aid at Clatsop Community College, including federal and state grants, work-study, and loans, is to complete the Free Application for Federal Student Aid (FAFSA). The FAFSA is free. Completing and submitting a FAFSA is the single most important thing you can do to get assistance paying for your education at Clatsop. The FAFSA collects information about you and your family. This information is used by Clatsop to determine your eligibility for student financial aid. Create a Federal Student Aid ID to get access to the online system. If you don't have an ID create one. Gather the necessary documents including: Social Security numbers, income tax returns, W-2 forms, records of untaxed income, bank statements and records of investments. List Clatsop on the FAFSA. Use Federal School Code: 003189. By doing this Clatsop Financial Aid receives the results of the FAFSA. Complete the 2018-2019 FAFSA for Summer 2018 through Spring 2019. Complete the 2019-2020 FAFSA for Summer 2019 through Spring 2020. Please contact us if you have any questions about which FAFSA to complete. September 17th is Constitution Day. This day commemorates the September 17, 1787, signing of the United States Constitution. Written in 1787, ratified in 1788, and in operation since 1789, the United States Constitution is the world's longest surviving written charter of government. Its first three words –– "We the People" –– affirm that the government of the United States exists to serve its citizens. For over two centuries the Constitution has remained in force because its framers wisely separated and balanced governmental powers to safeguard the interests of majority rule and minority rights, of liberty and equality, and of the federal and state governments. 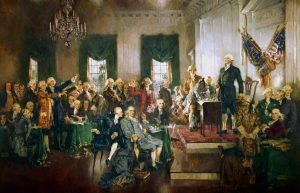 Since 1789, the Constitution has evolved through amendments to meet the changing needs of a nation now profoundly different from the eighteenth-century world in which its creators lived. Students and staff are invited to the Financial Aid Office in Columbia Hall on September 17, 2018 for a lively discussion on the "Living Constitution". students the opportunity to measure employment outcomes associated with Clatsops’s certificate programs. Clatsop no longer offers ECE or Practical Nursing as a degree option. Please see our catalogue for more information.